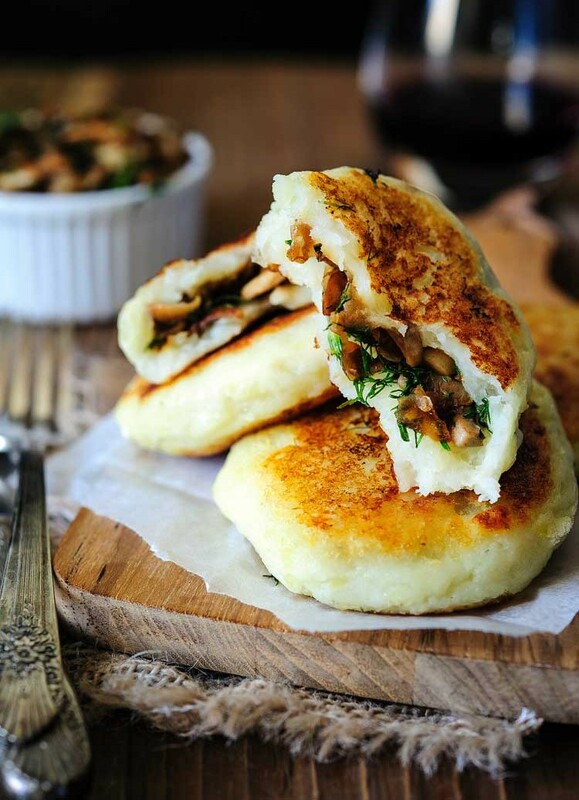 Vegan Potato Cakes stuffed with Mushrooms – Delicious way to use leftover mashed potatoes. Potato cakes are perfect for summer, fall or winter lunch. Use different herbs to change the flavour. It’s a delicious savoury vegan meal that even meat-eaters will love! I bake, I roast, I broil and toast. I make most of my main courses in the oven. I cook vegetables, fruit, and bread. I grill pita, make meatballs, warm stews. All of it in the oven, not on the stove. It could be meat roulades stuffed with eggs and fried. It could be fish cakes stuffed with dill pickles. Or, like in this case, it could be Vegan Potato Cakes stuffed with Mushrooms. These Vegan Potato Cakes can be made with leftover mashed potatoes or you can make vegan mashed potatoes specifically for this recipe. If you are using leftover mashed potatoes then they need to be pretty sturdy and not very thin or you might need to add a bit extra flour to make the mashed potato dough pliable. Vegan Potato Cakes stuffed with Mushrooms - Delicious way to use leftover mashed potatoes. Perfect for summer, fall or winder lunch, use different herbs to change the flavour ! Wash, peel and dice the potatoes. Boil the potatoes with bay leaf until fully cooked. While the potatoes are cooking, heat one tablespoon of oil in a large pan. 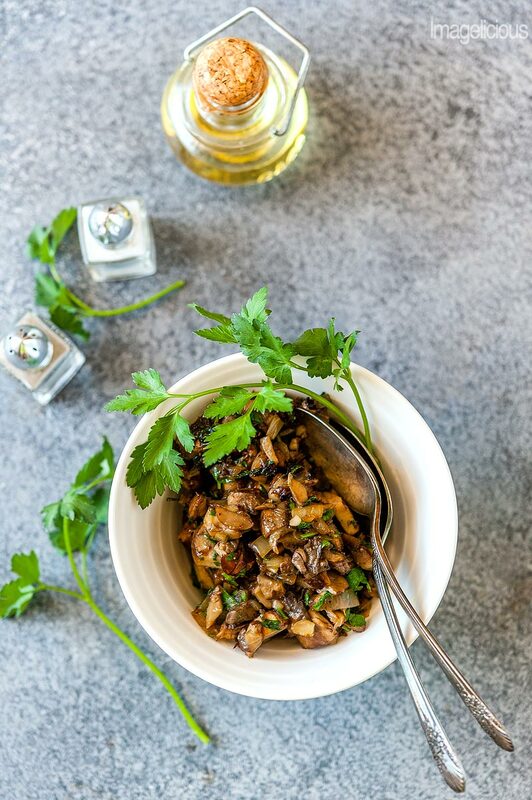 Dice the onion and coarsely chop mushrooms. Add the onion and mushrooms to the pan and cook on medium-low heat mixing occasionally until all the liquid evaporated. This will take about 15-20 minutes. Cook for another 5 minutes until the mixture starts to brown. Season to taste with salt and pepper. I use 1/4 teaspoon each salt, pepper, and dry thyme. Finally chop the dill (or other herbs you are using), add it to the pan with the mushrooms, mix and take off the heat. 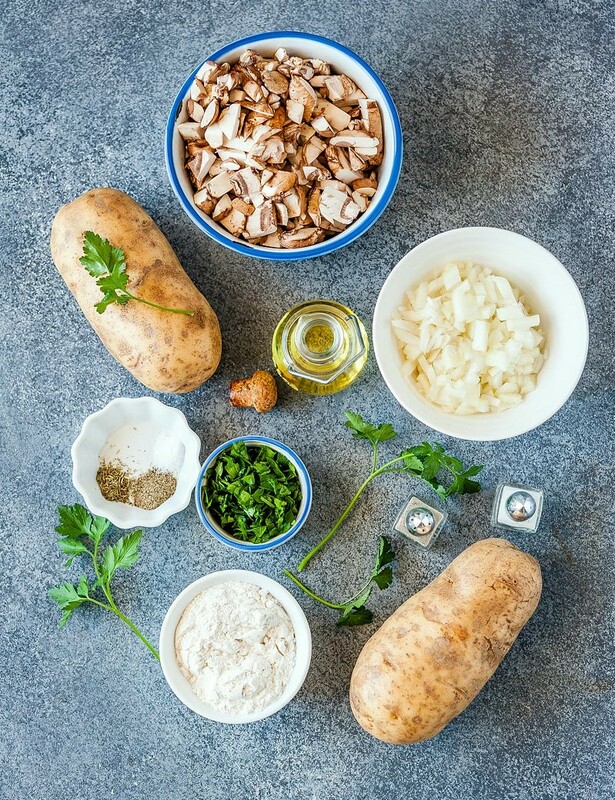 Once the potatoes are cooked, drain them well and mash with fork or masher, do not use food processor as it'll turn the potatoes watery. Season to taste. Add flour to the mashed potatoes and mix well. Alternatively, you could use leftover mashed potatoes. Take about 2 tablespoons of potato dough and flatten into a disk, place one spoonful of mushroom filling and cover with a bit more potato dough. Form into a disk. Once all the potato cakes are assembled, heat the remaining tablespoon of oil in a large pan. Place potato cakes on the pan and fry about 5 minutes until they turn golden, flip and fry another 5 minutes until golden. IMPORTANT: Use more oil if needed. Serve with the leftover mushroom mixture if any left, some lemon juice, mustard or horseradish. 0 Response to "VEGAN POTATO CAKES STUFFED WITH MUSHROOMS"